I've been hard at work recruiting *volunteers* for my 2012 Petties Award Campaign. If you're a Facebook fan, you may have already met some of our newer recruits. The jury's still out though on whether you get more votes with a basket of kittens or a hamster held for ransom. 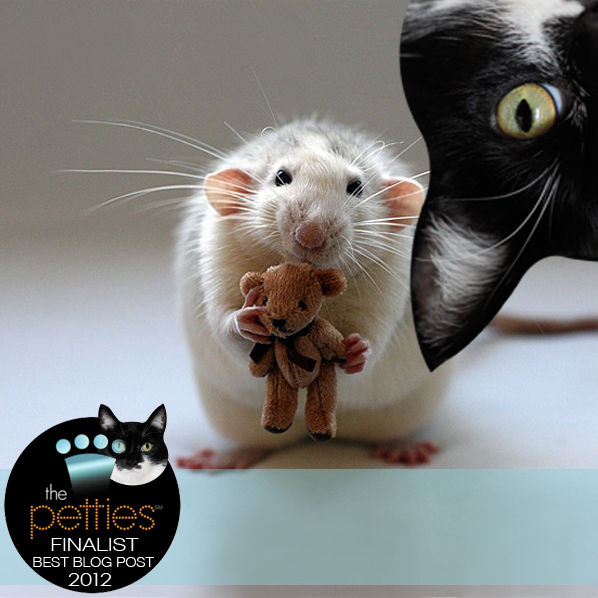 I know...you're sick of me asking for your Pettie vote for Best Blog Post. But I'm tenacious, competitive and not afraid of annoying you. I'm a CAT. Keep the kittens at home. Is that recruitment or a threat? You've done a great job with this blog! I've found it entertaining, innovative and quite pretty. I have been voting for you in the Petites, and I hope you do well in this competition! We're back from voting for guess who? Maybe you? Of course! I could never hold a hamster for ransom - Binga would eat him! We luv that you're not above these things! HaHaMeow! We're off to vote. Kisses! We'll go with the hamster! Just because he's holding a bear. Heehee. Now Bert & Ernie want a teddy bear, too! I know how you feel - we feel funny asking for votes every day, too (but we really want to donate to Cats Exclusive). I think you should stick with the kittens. Unless I get to eat the pig after I vote? Haha! Those are funny pictures! Don't worry we don't mind getting asked to vote a lot, your blog is fun to visit! Are you up to Mischief? You're safer with the kittens. We would be tempted to eat the mouse and hamster. We absolutely will vote for you when Mom next gets on FB... we love your creativity and think you're quite funny! Yes, Katie. Being not afraid to annoy is one of our best traits. Humans, especially old ones, NEED to be reminded daily. KATIE , have you stolen my 4 half-siblings ??!! Great job, Katie! Those volunteers sure are nice to help you out. MOL. WE're keeping our paws crossed for you Katie. Hey did Katie get her present yet? We are squeeing now! How very cute! We will go over to vote now, we haven't been there yet today. Love that first picture! Katie you are amazing with Photoshop! SERIOUSLIES. A hamster wif a teddy bear? It's got mommy doing theat high-pitched squealy-thing again....*sigh* I'll never figure her out.